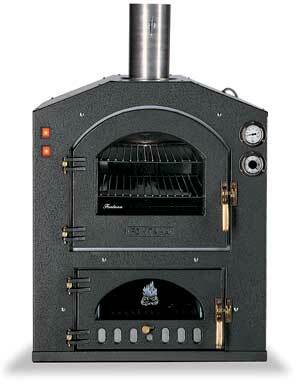 The Inc is the build-in version of the GUSTO, Fontana's best selling portable wood-fired oven. Many can be found in Italy to still be in use after 30 years of service. The Inc is a heavy duty unit that is made of a combination of cast iron, steel, and stainless steel for years of dependable use. They are extremely practical and easy to use - equipped with an interior light and a convection fan. It differs from the Inc Q in that it has 45 degree tapered top corners. The "Fitted" model, designed to be installed in permanent structures, both outside and indoor, makes it possible to personalize with an attractive design and characteristic cooking areas in the finest gastronomic tradition. Cooking chamber has supplementary steel sidewalls and refractory composition. INC 57V - Depth 24", Width 16", Height 16"
INC 57V - Depth 29", Width 30", Height 35"